Well I thought because of last months lengthy info letter on dog behaviour and how to introduce dogs to each other for play dates that I would write about something different... Seeing that it is the start of the 2011 mushing season in South Africa I thought to write a little something about it to all those out there wanting to start mushing this year. 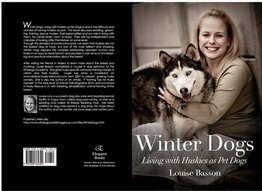 This info letter is just a short introductory to sledding, please visit our web site under winter dogs for more articles on sledding, or get your copy of Winter Dogs. Dryland sledding has become a very popular sport amongst Husky owners in S.A. and from all the styles available like canicrossing, bike-joring, carting and scootering it seems that to most mushers bike-joring is most popular. So what do you need for bike-joring? One or two healthy dogs willing to pull is needed as well as a mountain bike. I have a second hand bike that it hardly a bikers dream, but it is perfect for sledding; being inexpensive, has good brakes and is just the right height for me. You would also need a harness for your dog, now this would not be a regular walking harness but one specifically made for sledding. Sledding harnesses is well padded and tested over time through severe weather conditions and trails. Most often used is the x-back harness or H-back harness which is your traditional sled harnesses. I however prefer to make use of a long distance harness which come around just behind the shoulder blades of the dog. This harness is specifically made for your higher attachment like with bike-joring, scootering or canicrossing. The long distance harness is also easier to fit on a dog for a less experienced musher. Last but not least you need a gang line which attaches to the bike on the one side and the dog's harness on the other side. Never attach gangline to the person it self as it is very unsafe. If you have really fast and strong dogs your dogs will keep on dragging you along if you fall off the gangline can also pull the steering wheel if attached to you and could cause you to fall. If the gangline is attached to the bike when you fall you stay behind and at some point the bike might actually get stuck to a tree etc stopping your dogs. A quick release system is best and if you have a added bungee cord in your gang line it's great to help absorb some of the shock from pulling. Starting off you want to make sure that your dog is not spooked by the bike pulling behind him, this is the reason why I prefer starting with canicrossing so that your dog can get used to pulling something that he does not feel so unsure about. The more you practice the less your dog will worry what is going on behind him. If however your dog does not want to pull at all you can make use of a "rabbit" a person on a bike riding in front of you encouraging your dog to follow. What makes bike-joring different from biking with your dog is that you do not peddle along and your dog runs in front of you instead of beside you. You will only peddle when you start off if needed and when you are going up hill, making sure to use the brake before going down hill so that you do not run over your dog. When bike-joring the gangline should be taught at all times, other wise it will get stuck in your front wheel. This is also key to knowing if your dog is pulling in harness. The only way to not run over a gangline that is loose is if your dogs are running beside you but then they are not pulling in harness. You need to teach your dog to line-out which you will use when you need to stop to rest your dogs. If you are able to rest you are able to run further. Or you might need to stop to check on your dogs paws etc. It's important to know your dog and his natural pace and gait so that you know when you should stop. Never completely tire your dog, always stop for them to want more so that they are always excited to go mushing and this way you are limiting injuries. Other cues we use are onby which is to leave objects in their environment that we are passing by as well as gee/haw (right/left). Read more on our web site about increasing the distance and building up muscle memory. Reply to this letter for more information on our sledding seminar for 2011 as well as our sledding club.